CHATEAUGAY – After years of housing the pastors who served St. Patrick’s Church, the rectory in Chateaugay now houses bicycles, basketball games, laughter and service. The rectory now serves as the residence of Deacon Brian T. Dwyer, pastoral associate for four parishes and six worship sites, as well as his wife and five kids. Ordained as a permanent deacon in 2009, Deacon Dwyer worked for over six years as Diocesan Director of Youth Ministry before moving into his current assignment. 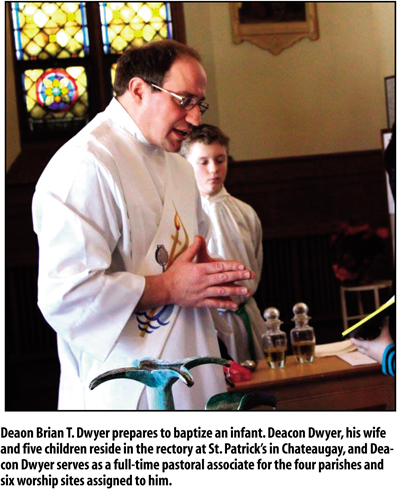 Living in Chateaugay, Deacon Dwyer said his assignment includes administrative duties for. St. Patrick’s and St. George’s, as well as ministerial duties in all six churches, which span over three school districts and touch three counties. “Because my day begins and ends here, I work regularly with the parish secretary and bookkeeper,” he said. In terms of ministerial duties, Deacon Dwyer fills a variety of needs. While he grew up on a farm in Chateaugay and was well-known in that community, Deacon Dwyer has had to work to establish relationships in Westville, Constable, Bombay and Fort Covington. And it’s those small things that Deacon Dwyer sees as most integral to his ministry. While he noted the live-in model may not be ideal for everyone, Deacon Dwyer says his current assignment has been a blessing for him and his family. Both Deacon Dwyer and Father Kornmeyer said the arrangement has been well received by the parish community. “I’ve heard only positive comments,” added Father Kornmeyer. “People are glad to see life in the rectory. And Deacon Dwyer has done a great job. He’s really good with people, he’s solid in his theology and he has a good perspective.